Try this delicious and highly nutritious cranberry berry smoothie as a tasty snack, sweet dessert, or healthy meal to start your day. The combination of berries in this smoothie impart a great deal of vitamin C, dietary fiber, manganese, and vitamin K. They also offer much in the way of free radical scavenging antioxidants. Cranberries are the star of this smoothie; so let’s take a closer look at how they support your health. Studies have shown the phytonutrients (plant nutrients) in cranberries to be potent antioxidants, anti-inflammatory, and anti-cancer. 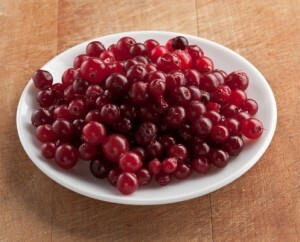 Cranberries offer protection against urinary tract infections, support the immune system, benefit the cardiovascular system, and are great for the digestive tract. It should be noted that to experience all the wonderful health benefits of cranberries you’ll need to consume the whole fruit and not just the juice. Although the juice is healthy on it’s own as long as it’s not laden with sugar. Stick to 100% cranberry juice. This recipe calls for cranberry juice, but you could substitute water as long as you have cranberries to use. For extra cranberriness, use both cranberry juice and actual fruit. As always, the recipe below is a guideline, feel free to add/remove and ingredients as you see fit. Place all of the ingredients into your blender and blend on high for 30-45 seconds or until the desired consistency is reached. Please let me know if you try this smoothie by leaving a comment below. Happy Blending! I didn’t find any cranberries but I do have cranberry juice ( nothing added, just 100 percent cranberries). Do you thing just using 1 cup will be ok? One cup of 100% cranberry juice is perfect, Ron.